Help increase your productivity with a black print speed of up to 42ppm. 250-Sheet capacity paper tray adjustable for Letter or legal plus a 50-sheet capacity multi-purpose tray for envelopes or alternative media types. Total capacity expandable to 1,340 sheets with optional add-on trays. Easily share with others via built-in Ethernet networking or print locally via USB interface. Help save paper and create two-sided documents with automatic Duplex printing. Restrict unauthorized printing and help protect sensitive documents with advanced security features including secure function lock, secure print and more. 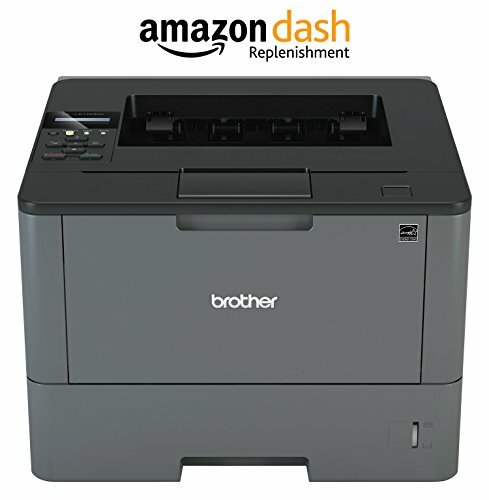 Compatible with: air print, Google Cloud print 2.0, Mopria, Brother I print & scan, cortado workplace. Print professional business documents with bold, crisp text and sharp images at up to 1200 x 1200 dpi resolution. Backlit LCD display for easy navigation and menu selection. 1-Year limited warranty with free phone support for the life of your machine. Operating systems compatibility windows: XP home / XP professional / XP professional X64 Edition / windows Vista / windows 7, 8, 8.1, 10 / windows Server 2003 / 2003 R2 (32/64 bit) / 2008 / 2008 R2 / 2012 / 2012 R2 Mac OS x V10.8.5, 10.9.X, 10.10.X Linux. Print from mobile devices over a wireless network. Share the HL-L5100DN with multiple users on your network via its Ethernet interface.